A fund set up to help victims of Cumbria's devastating floods has handed out £500,000 to organisations, charities and households. The Cumbria Flood Recovery Fund has received £1.73m in donations and pledges since it was established in November last year. Emergency grants have helped 454 households affected by the floods. And grants of £50 were made to affected young people under the age of 18 to help towards Christmas. 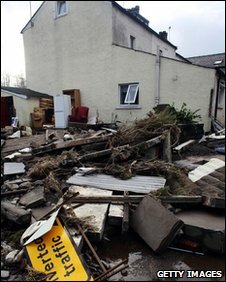 Floods which swept the county in November 2009 destroyed homes and businesses and left many householders in temporary accommodation and without possessions. A large number of those affected were underinsured. Deb Muscat, grants development officer for the Cumbria Community Foundation, which set up the fund, said donations had helped people who had lost their job or who were self employed and unable to earn a living, as well as helping people whose homes had been flooded. She said the fund had also helped people with increased heating bills because they were living in damp, cold properties. She added: "Experience from around the UK shows that there are two main phases to flood recovery grant making. "The first is the initial emergency and the second phase is when people move back into their homes and know how much the insurance companies have paid." Ms Muscat stressed that even those who had received an initial grant from the fund, were still eligible to apply for another one. Organisations which have benefitted from the fund include, Churches Together in Cockermouth, Maryport Inshore Rescue Boat, Workington Ladies Guild, and The Cockermouth Cricket Club.